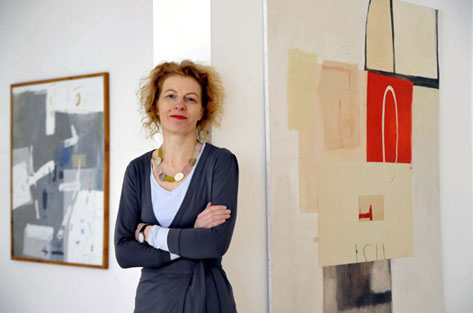 Caroline Billing, owner of The National in New Zealand, participated in a fair with three of the artists she represents, and AJF took this opportunity to interview all of them about their work. They are articulate and smart. No wonder the New Zealand jewelers are making their mark internationally. Susan Cummins: Can you describe the Kete fair and symposium event? Caroline Billing: Kete was a four-day art fair and symposium that was recently held in Wellington, New Zealand. It is a new event (this was its second incarnation) and the first of its kind here for us. The concept is to bring together galleries to showcase their selected artists across different craft mediums. Talks around the subjects of collecting, artists’ practices, and current issues in craft were held, and it included keynote speakers during the daytime and evenings. Caroline Billing: I represented three of my jewelers at Kete with the aim of highlighting three distinct and successful current practices by New Zealanders in contemporary jewelry. 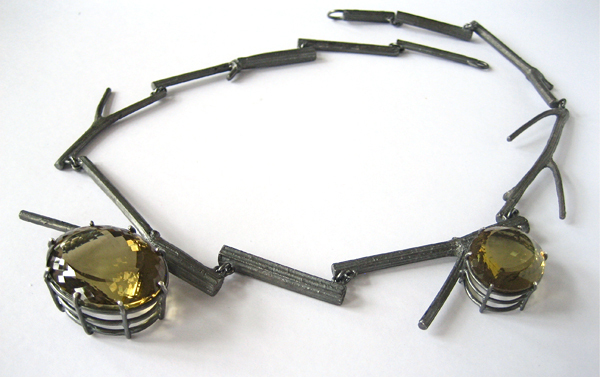 Volker Atrops and Brigitte Schorn are, yet again, another couple that makes jewelry. We are in the midst of what feels like the sudden recognition of many couples who live together and sometimes work together to make art jewelry. I think this has probably always been around, but now galleries and couples want to show the work together. It is a moment. This show at Jewelers’werk Galerie called Vintage Violence has an intriguing history and fascinating story. Susan Cummins: Where does the title Vintage Violence come from? Brigitte Schorn: It comes from John Cale’s first solo album. Volker Atrops: Yes, and it is a totally different context, but in our case it fits very well—“vintage jewelry” and “violence” because we pushed the material against all the rules into the extremely heavy, old machines. It took brute force but gentle output. Arline Fisch is an American jewelry pioneer. She is also one of the earliest American post-war jewelers to be shown and collected in and outside of the US. Starting the San Diego State University metalsmithing program and teaching there for more than 40 years, she has influenced hundreds of jewelers who studied under her. Still going strong and still curious enough to join AJF on our trip to Amsterdam last year, she is a true example of the strong spirit of the post-war generation. This show at Mobilia Gallery called Hanging Gardens features the colorful new work by Arline. Susan Cummins: You are one of the reigning queens of jewelry making now, but you had to start somewhere. Could you tell the story of how you chose to make jewelry? Arline Fisch: Becoming an artist was my goal from an early age. I chose Skidmore College for my undergraduate study because it had a large studio art program within a liberal arts curriculum. I enjoyed combining studies in literature, language, and psychology with studio work in painting, crafts, and design, receiving a degree in art and art education. Curiously, I did not take any jewelry courses. My interest in teaching at the college level led to immediate enrollment in a masters degree program at the University of Illinois in Urbana/Champaign. As part of my course requirements, I took painting, ceramics, and metal in my first semester, and I found that working in metal was the most satisfactory. The professor in the metals area was Arthur Pulos, a well-known silversmith whose curriculum included design and techniques in both jewelry and smithing. I continued to work in metal for the entire two years of my MA program, although I was not sure where it would lead me. Helen Britton has created one large piece for her exhibition at Galerie Spektrum. This piece is made up of a number of parts, referring to the disturbing “Ghost Trains” of her youth. While jewelry is a part of this piece, it is not the main point. Susan Cummins: What does Unheimlich, the title of your exhibition, mean? When Sigmund Freud’s seminal work (Das Unheimliche, 1919) was translated (into Italian), the term “the disturbing” was used, deriving from perturbamento, the state of people or things that have been deeply disturbed or upset. The accent is, therefore, on the effect of a shock, of a loss, of tranquility and serenity. What is it that produces this reaction? What is the origin of such profound disturbance? Hans Stofer is a trickster. He appears to be casually wrapping random objects together without any consideration of their effect, but these assemblages of books, shoes, cups, and other everyday objects are puzzles that cause us to think. The things we live with have a time frame and a meaning beyond their use, and Hans gives us an opportunity to contemplate them in relationship to each other and their meanings singularly, outside of their usual functional role. The show at Gallery SO is called String Theory and is well worth a slow and careful look. Susan Cummins: Since I have not seen the work in this show in person, can you please confirm that the objects you are using are the real thing, and therefore a shoe is the scale and material of a shoe? Did you make these objects, like Richard Shaw the California ceramist does, or again are they things you have found? Hans Stofer: Everything I have used is either from my studio or my home. It’s stuff that I have accumulated over the years. Nothing is made or has been altered. The only new element is the use of string to tie the stuff together. Nina Sajet, like many Dutch before her, loves to make a “still life,” those life and death arrangements of flowers, fruits, and vegetables sometimes with bugs or dead rabbits included. Her show at Galerie Marzee is called Still Life and includes ceramic castings of a variety of fruits displayed in bowls and containers—just like the old masters. Susan Cummins: Can you tell us the story of how you became interested in making jewelry? Nina Sajet: Jewelry has always been a part of my life. When I was a little girl, I loved to play with beads, making necklaces, bracelets, earrings, and rings. During my studies at the Art Academy in Arnhem in the Netherlands in the product design department, I learned a lot about different materials and techniques and the way to create a product from an idea, and slowly I rediscovered the old feeling of pleasure of making jewelry pieces. Anya Kivarkis looks back at the September issue of Vogue magazine from 2007–08 to recreate the jewelry in the images of flappers from the roaring 1920s depicted there. Her investigations also include thoughtful comments on the economics of excess and luxury from the 1920s and 2008 through the jewelry. How we receive these messages through images has been a theme of her work for a number of years and is part of her thinking about this body of work as well. Anya’s show at Galerie Rob Koudijs called September Issue is very dense and layered with multiple subtexts. It is quite impressive. Susan Cummins: Can you give us a snapshot description of your background. Were you trained as a jeweler? Anya Kivarkis: I received an undergraduate degree in craft with a focus on jewelry and metalsmithing from the University of Illinois at Urbana-Champaign. I continued with graduate school in the metal program at SUNY, New Paltz. It was really the combination of programs that enabled me to be a strong maker of both hollowware and jewelry and to think critically about my practice. They left me interested in the possibilities of working within the conditions of the discipline of jewelry and metalsmithing and in mining the history, objects, and subjects embedded in the field as content. I also worked for several years as a jeweler in Chicago between undergraduate and graduate school. Susan Cummins: Please tell the story of where you were born and raised and how you became interested in making jewelry.